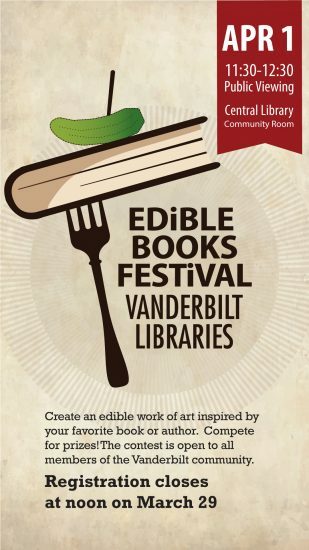 The campus and community are invited to join us for the second festival on April 1st to experience the delightful collision of books and food. “Last year’s entries were extremely clever. The libraries are glad to again be part of this global celebration of books and food,” said University Librarian Valerie Hotchkiss. Participants should drop off their entries between 9:00 and 10:00 a.m.; public viewing begins at 11:30 a.m. and judging at 12:15 p.m. followed by our favorite part—eating the books!